Why is latest game running so slow? Why can’t I fit one more movie in this supposedly big hard drive? First one is easy – latest game runs fast only on latest computer. It’s bundling – you are supposed to buy them together. Second one requires bit of researching. Since ancient times (like before Windows) information about file sizes was delivered to users by numbers. It is very exact information. And somewhat hard to digest. Treemap is a concept of displaying something with bunch of rectangles. Bigger rectangles mean bigger things. 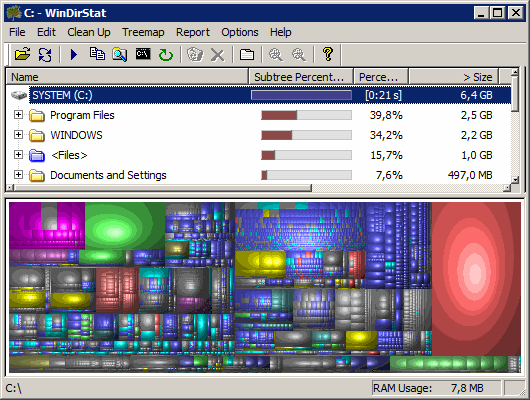 WinDirStat uses treemap to display content of your HDD. get directory tree and treemap. Then you can browse around and see (literally) what is eating precious space. There are buttons that open directories in Explorer or command line and even delete stuff. Warning! Don’t delete files you don’t know. Especially anywhere near system partition (where Windows is installed). WinDirStat does one thing and is good at it. Like software should be. Freeware and open source. Not natively portable (writes settings to registry) but available as such from PortableApps.